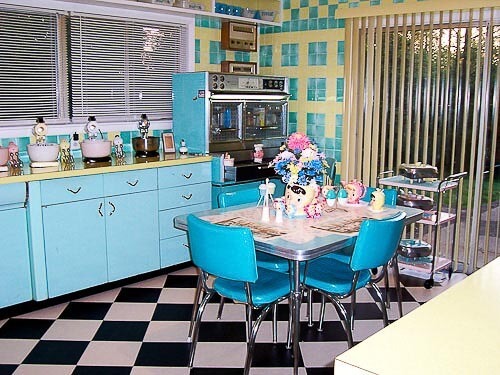 Home » Kitchen Help Category » Readers and Their Kitchens » Lori’s pink, blue and yellow retro kitchen: A whole lot of lovin’ fun! 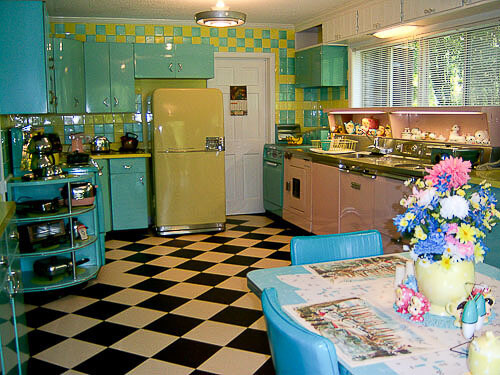 Lori’s pink, blue and yellow retro kitchen: A whole lot of lovin’ fun! all the metal cabinets and brought them home. I’m so glad that you liked the pics of our house. It’s really been a labor of love. My husband was transferred from his job in Atlanta to North Carolina ten years ago. 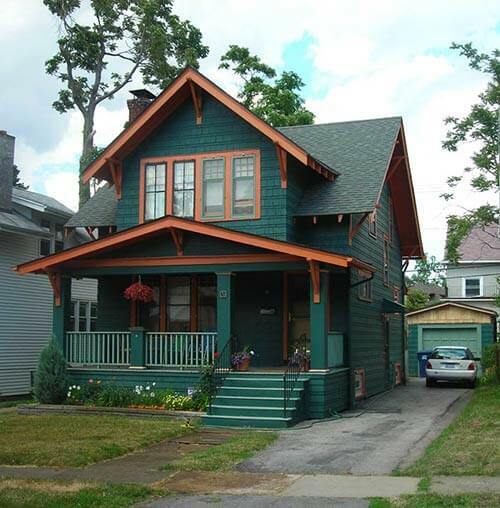 So when we started our house hunt we decided to look for a house built in the 50’s that we could redo. We found this house almost immediately and saw tons of potential in it even though the current owners had pretty much destroyed any of the original fixtures and finishes in the house. 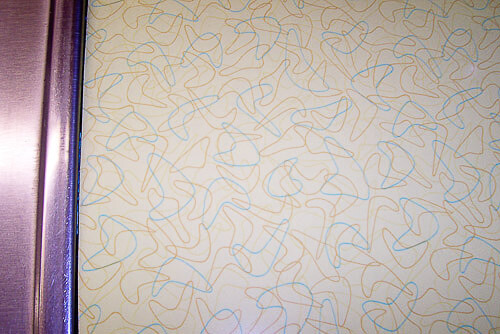 There was carpet on all the floors and cheap vinyl peel and stick tiles on the kitchen and bathroom floors. And the walls were all painted a drab shade of beige. I have to admit our toughest renovation project was the kitchen. Our kitchen is huge and runs almost the full length of the side of our home. 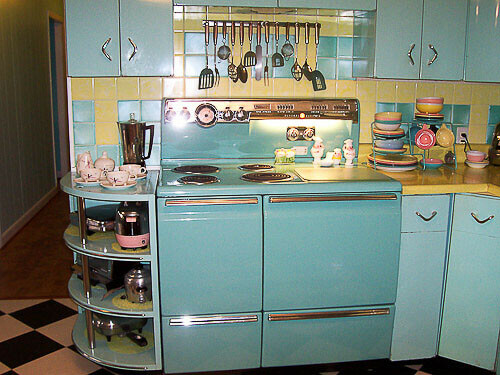 We’ve got two working 1950’s fridges and my Turquoise GE LIBERATOR stove is used on a daily basis. And our kitchen opens onto our outdoor patio. We literally gutted everything out including the cabinets, sink and floor. It took us over a two-week period to gut the kitchen and then install the metal cabinets. And then it took us two weekends to put down the Marmoleum floor. We started searching on EBAY (love EBAY) for metal kitchen cabinets and were fortunate enough to find a complete set of YOUNGSTOWN KITCHEN metal cabinets in AQUA from a seller in Detroit. Our family is from Ohio, so on a trip to visit them we rented a truck and loaded up all the metal cabinets and brought them home. All they really needed was a good cleaning and then we attached them to the walls. Also I found a complete grouping of GE TURQUOISE cabinets from an EBAY seller in DAYTON so we picked up that set as well. And we just combined the Youngstown and GE cabinets to add lots of extra storage space and counter space. 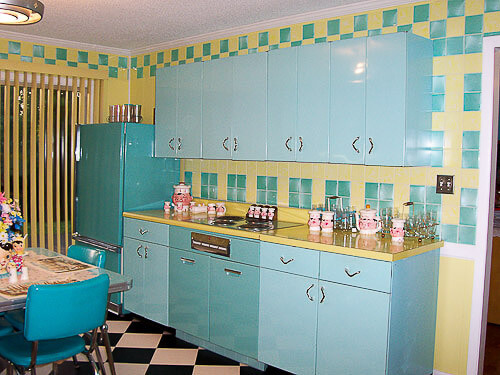 The counter tops are all original YELLOW/AQUA boomerang laminate that came with the GE cabinets. 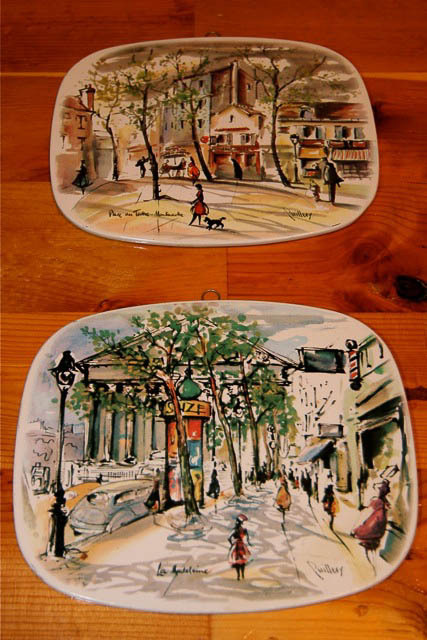 I also bought on EBAY all the yellow/aqua tiles, they are HOMART ORIGINAL 1958 tiles, that you see on the walls and we designed a pattern and then put them on all the exposed walls. They had wood paneling originally in the kitchen that someone had painted, so it wasn’t useable so we decided putting tiles up were the way to go. 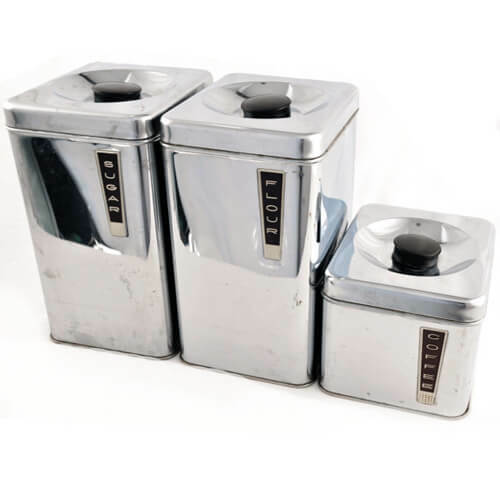 As for my 1956 AQUA GE LIBERATOR stove I bought that on EBAY as well from a lady in Cinncinnati Ohio. It was her original stove. 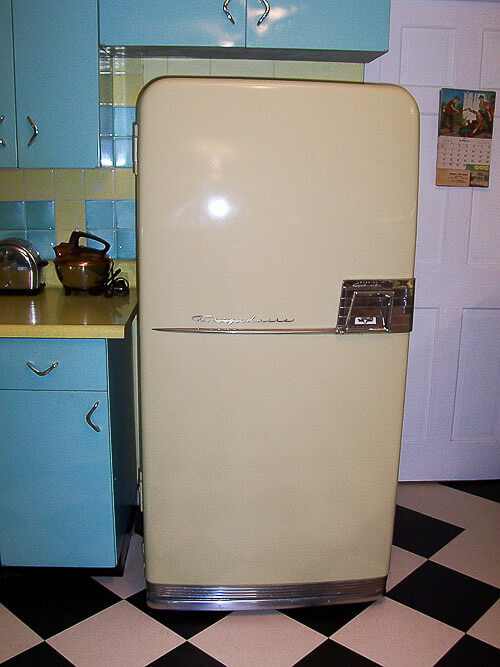 And the Yellow FRIGIDAIRE fridge, another EBAY buy from a gentlemen in Columbus, Ohio. 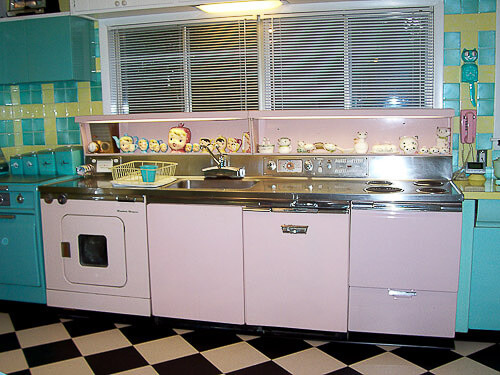 And my pride and joy the 1956 PINK GE KITCHEN CENTER from a gentleman in New York. Again it just needed a good cleaning and my husband wired it up for the lights and we’re working on getting the stove, dishwasher and dryer/washer combo working. He’s an electrical engineer so that comes in handy. As for the flooring we had originally put down black and white VCT tiles when we first moved in, but they were so hard to keep clean so last year after seeing the Marmoleum on your website we decided to put that down on our kitchen floor. We bought the black and white click loc Marmoleum tiles and then we put them on a horizontal slant rather than just a black and white checkerboard design. I think it really sets the kitchen off. Our light fixtures we got from a seller on EBAY from Arizona. 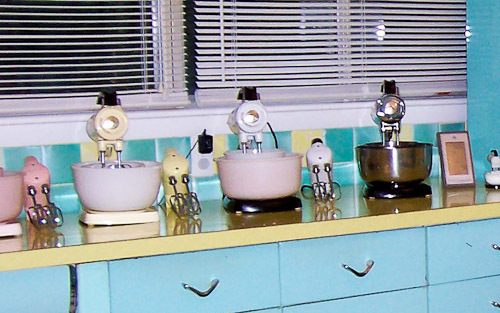 They were actually in a CHURCH cafeteria that had been built in 1959 and they were original. And they were in like new condition. And then all the little details from the SUNBEAM mixers, waffle irons, cannisters, etc. we pretty much have bought those along the way..where else but EBAY. And my little kitchen table and chair set was a great find at a local flea market for $50.00 and even though it was not in the best of shape with a little elbow grease and wax it came out really great. I hope everyone enjoys the pics and our TALES of KITCHEN RENOVATION. 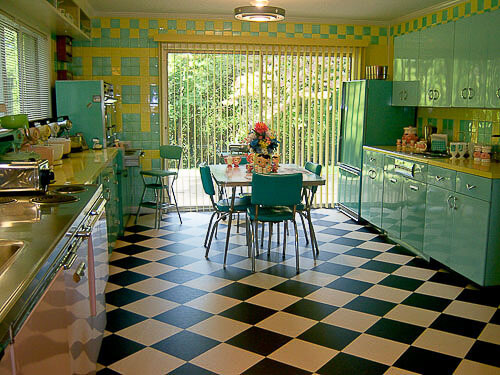 Consider us “addicted” to your FANTASTIC RETRO RENOVATION website. Yes we did. We bought Krylon Plastic spray in Butter Cup yellow for the kitchen. And in the living room we used the Ballerina Pink in Krylon Plastic. Beautifully done, Lori and Ed. Thank you so much for sharing.